With the release of "Skyfall," Bond's 23rd adventure, right around the corner, we look back at some of his biggest missteps. Even James Bond (here played by Daniel Craig) misfires now and then. For a man with so many iconic attributes, James Bond sure does go off the rails now and again. 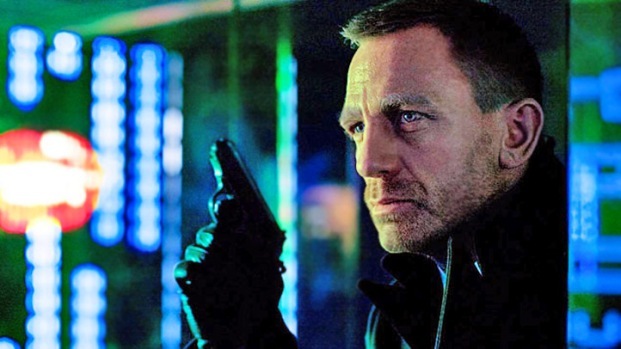 With the release of "Skyfall," Bond's 23 adventure, right around the corner, we look back at some of his biggest missteps. Bond in a Dive Bar and Orders a Bud with a Wedge of Lime in "Licensed to Kill"
For average workaday Joes, going to a dive bar teeming with ruffians and roundheels can be a fun, cheap way to pass an evening. For James Bond, it is a non-starter. 007's morals may at times be a wee squishy, but the man's hygiene and style are unwavering beacons, stars the rest of us are constantly reaching for. But let's pretend for a moment that our hero were to find himself in such a dump, he still wouldn't order a beverage as pedestrian as a Budweiser and sully it with fruit. If Bond survived that, we can surely get past the Heineken he'll be drinking in "Skyfall." Bond Goes Tsunami Surfing and Grows a Beard in "Die Another Day"
Bond's exploits regularly strain the bounds of credulity, but he pulls it off by having whatever he's doing be more awesome than ridiculous. That formula breaks down like a laser-beamed iceberg in this idiotic scene made even more egregious by some of the worst special effects in the franchise's history. And while Bond's not infallible—he gets captured and tortured now and again--he does not grow beards. Whether he keeps a shaving kit secreted away in a cavity, is naturally hairless or stanches the growth if his whiskers by sheer force of will we may never know. And frankly, it's none of our business. Bond Rents a Ford Focus in "Casino Royale"
We get it, these movies aren’t cheap to make, but putting James Bond behind the wheel of a Ford Focus is no way to defray costs. Aston Martin, Alfa Romeo, Bentley… these are the cars of international intrigue. Bond's time behind the wheel of a Focus makes his trip on an AMC Hornet seem positively dignified. Bond Goes Digital in "The Spy Who Loved Me"
Bond hangs up his classic Rolex Submariner in favor of a Seiko 0674. Let's forget for a moment about the fact that 007 eschewed the most iconic wristwatch ever made, and instead contemplate the fact that the man opted for a digital timepiece. No. Just no. The 0674 isn’t even water resistant and the coolest thing about it, the built-in ticker-tape machine, was a fake. Bond Takes a Bride in "Her Majesty's Secret Service"
007 has slept with so many women, north of 50 by some counts, that the term "Bond Girl" is a part of the zeitgeist. What he doesn’t do is marry women, and if he were to take a knee, it wouldn’t be for help hunting a criminal, not even Blofeld. That said, of all the women Bond "dated," Diana Rigg was easily the most worthy of marriage. Bond Sings in "Dr. No"
It matters not that it came in response to the sight of Ursula Andress emerging from the sea looking like Venus herself, Bond don't sing--and if he did, it wouldn't sound this bad. It almost seems unfair to declare something from the first Bond film to be un-Bond-ly, but for the man we've come to revere as the very essence of cool, the standards are a bit higher. Global James Bond Day is Oct. 5. "Skyfall" opens in theaters Nov. 9.